PCD Pharma Franchise in Himachal Pradesh – If you are looking for pharma PCD franchise deals in Baddi, Kangra, Shimla, Mandi, Bilaspur etc, the Top Pharma Franchise Company in India’ Biofield Pharma is the best to choose. Our company has 300+ ranges of pharmaceuticals drugs like tablets, capsules, syrups, injection medicines, soft gels, ointments, powders etc. PCD pharma franchise in Himachal Pradesh is the best way to start your business in the northern region of India. We would like to invite people who are interested in a good business deal in Himachal Pradesh. Himachal Pradesh is a paradise for pharma people. It is the pharma hub of India with Baddi situated here. The demand for quality medicines is growing with each passing year. By opting for PCD pharma franchise in Himachal Pradesh, one can actually start their own business here. Biofield Pharma is the best-known pharmaceuticals company to bring you multiple offers of PCD franchise here. You can start your business as general medicines supplier or any specialized therapeutic drugs distributor. We have orthopedic range, pediatric, nutraceuticals, dermatological drugs, diabetic, cardiovascular medicine etc. the prices of all the medicines are genuine and will meet the required demand for good business. 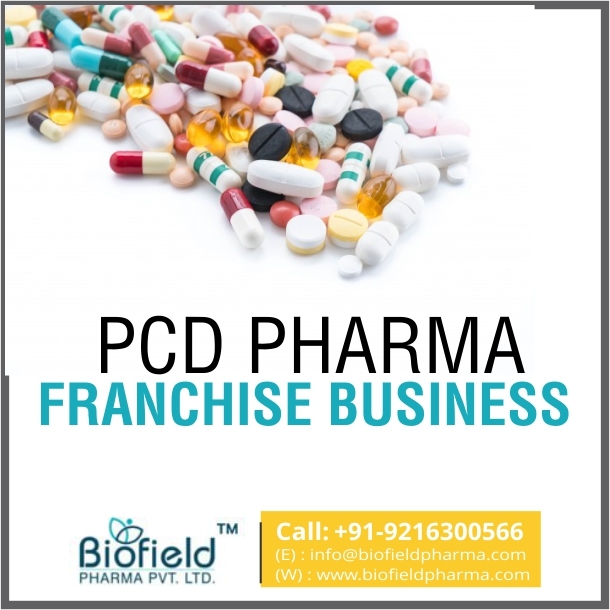 To know more about our PCD franchise business opportunities near you dial +91-9216300566, +91-9216300166 or email queries at info@biofieldpharma.com. Our company will be looking forward to a good conversation with you. For a hassle-free talk, you can even choose our live chat service or leave a text through a contact inquiry form. We have produced our 300+ range of medicines in GMP-WHO units. All the quality measurements have been met with the utmost care and dedication by our staff. A-grade quality ingredients, experts and drugs are used in the perfect composition for pure, effective and safe formulation. You can rely on us for better results. None of our products has been tested on animals. The medicines are DCGI approved and meet your requirements for good products list. By starting your own business, you get to have a stable income and a better career perspective. It is our assurance to offer you quality drugs and better scope in the market. Why Start Pharmaceuticals Business in Himachal Pradesh? The demand for quality medicines and products has grown over the years. With a growing economy, derma market in HP is growing in demand. Pharmaceuticals sector also all your day-to-day needs like creams, lotion, ointments etc. Thus, you enjoy a business on a monopoly basis. The number of dermatologists, doctors, hospitals, and clinics has increased over the past few years. This has helped create awareness for good medicines. Massive propagation by government and health professionals have helped raised awareness related to health ailments and their concerns. People are willing to spend on healthcare needs and quality medicines. Get marketing support through an attractive list of promotional tool items. On-time delivery of products and medicines is our promise. Genuine sales target through the journey. On achieving regular sales target, get awarded with good incentives and bonus from the company.